If you have any questions about the Kaiser85 information page below please contact us. 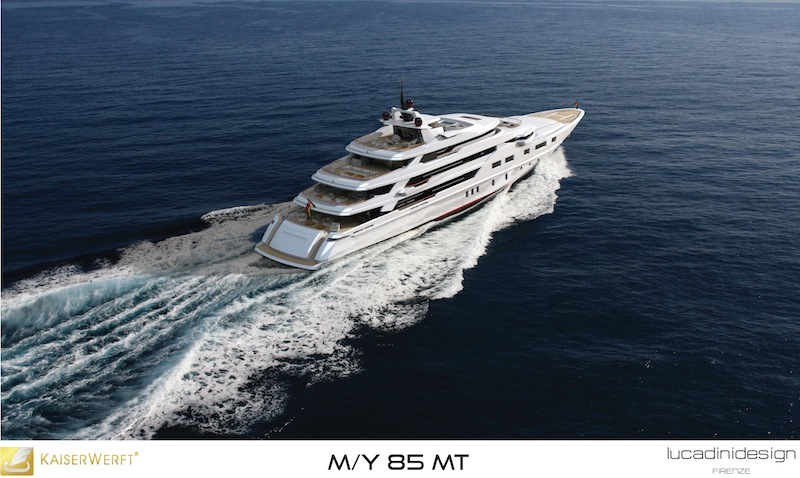 With launch in 2016, the impressive 85-metre motor yacht Kaiser-85 is a breathtaking vessel, constructed by the prestigious German shipyard, KaiserWerft. 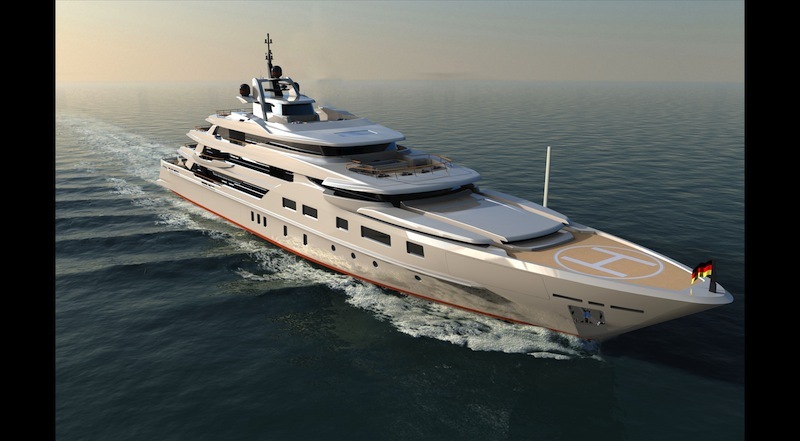 Boasting elegant and distinguishing lines, Kaiser-85 superyacht is designed by well known Italian designer, Luca Dini. Superyacht Kaiser-85 features casual yet sophisticated, minimal yet homely, contemporary interiors, mixed up with a crisp linear design discipline, resulting in pure understated luxury. The materials express warmth and variation of tone and texture, whilst offering a refined elegance without excess. A combination of raw rustic detailing, neutral panels in leather or paint with accents of rich stone or timber, combine to create a cool modern look. The owner’s suite strenghtens the openness of space through the use of an innovative mirrored partition, which offers adjustable privacy between bathroom and bedroom. The main saloon, stairs and dining area create an air of relaxed, spacious elegance, while the VIP Suite offers ‘chic hotel’ intimacy with a rich yet harmonious aesthetic. 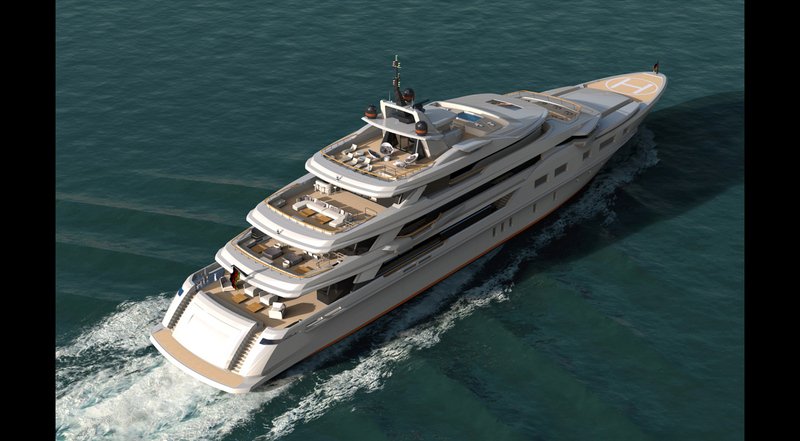 Mega yacht Kaiser-85 is driven by four diesel electric engines and Voith Schneider propulsions. Luxury superyacht Kaiser-85 provides elegant and comfortable accommodation in a spacious Owner's suite, fitted with innovative mirrored partition to provide privacy between bathroom and bedroom. There is also a beautiful VIP Suite, providing 'chic hotel' intimacy. 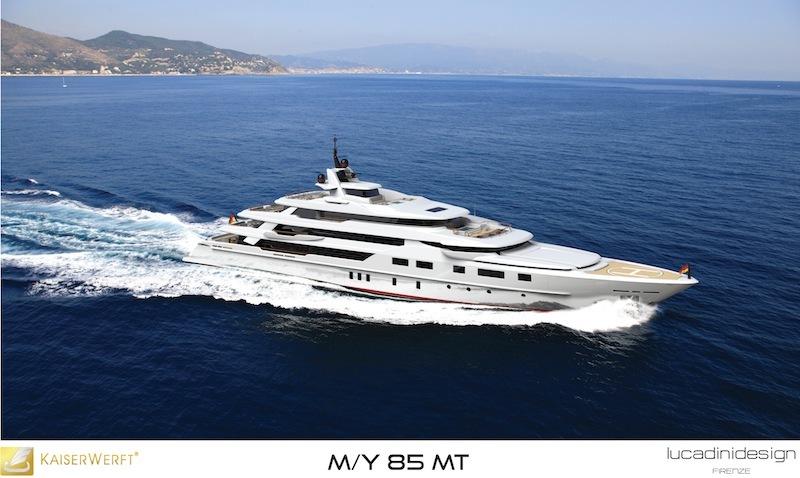 We do have available further amenity, owner and price information for the 85m (279') yacht Kaiser85, so please enquire for more information. 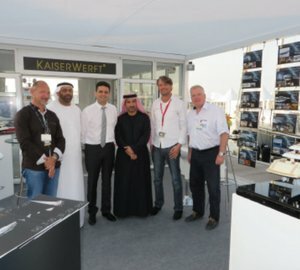 The luxury yacht Kaiser85 displayed on this page is merely informational and she is not necessarily available for yacht charter or for sale, nor is she represented or marketed in anyway by CharterWorld. This web page and the superyacht information contained herein is not contractual. All yacht specifications and informations are displayed in good faith but CharterWorld does not warrant or assume any legal liability or responsibility for the current accuracy, completeness, validity, or usefulness of any superyacht information and/or images displayed. All boat information is subject to change without prior notice and may not be current.